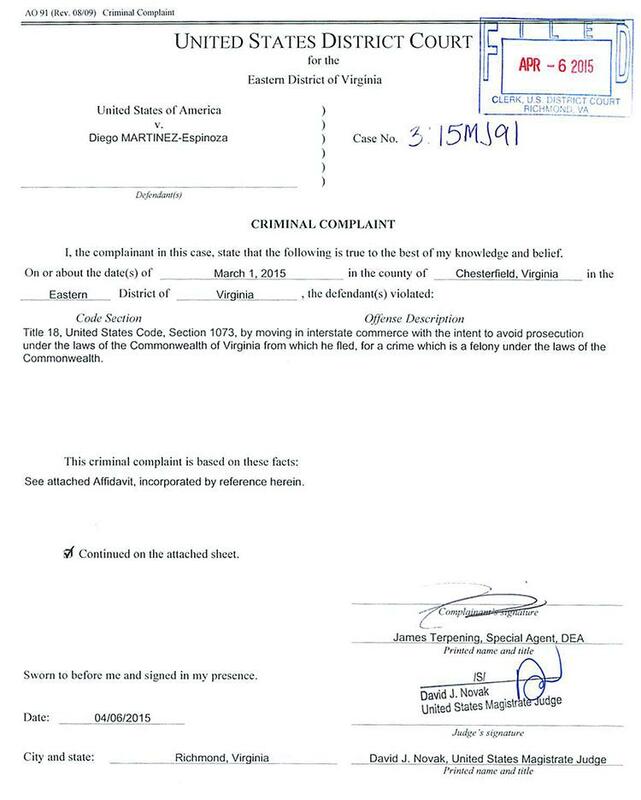 APRIL 24--A Mexican citizen facing U.S. cocaine trafficking charges is being hunted by federal agents after he slipped out of a court-ordered GPS monitoring bracelet and placed the device on his cat, a ruse that allowed him to flee from his Virginia residence. Diego Martinez-Espinosa was arrested last New Year’s Eve in while attempting to take possession of 19 kilos of cocaine. At the time of his collar, Martinez-Espinosa (seen above) told a Drug Enforcement Administration agent that he was in the United States illegally. 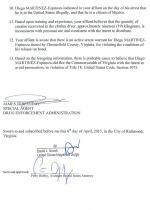 Martinez-Espinosa, 23, was subsequently charged in Virginia state court with felony narcotics conspiracy. Though he was facing a stiff prison term--and was in the country illegally--Martinez-Espinosa was not locked up on an immigration detainer. In fact, he was granted bond, a provision of which required him to wear an ankle monitor “so that his whereabouts could be tracked,” court records note. In late-February, law enforcement officials received a series of “strap tamper” alerts sent from the GPS device being worn by Martinez-Espinosa. But on each occasion, investigators determined that Martinez-Espinosa was wearing the device and remained in the immediate area of his residence or place of employment. 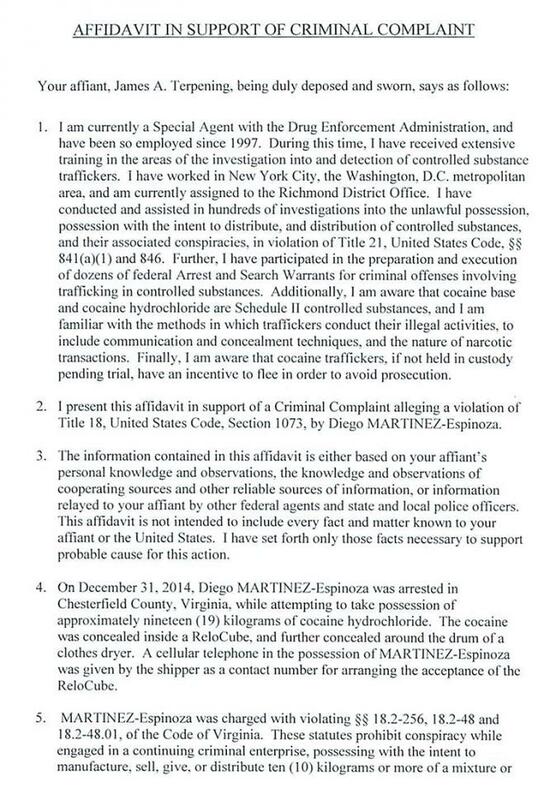 The repeated warnings resulted in “a belief on the part of the person assigned to monitor Martinez-Espinosa that the GPS unit was malfunctioning,” according to an affidavit sworn by DEA Agent James Terpening. In hindsight, it appears that Martinez-Espinosa was tinkering with the device in preparation for flight. 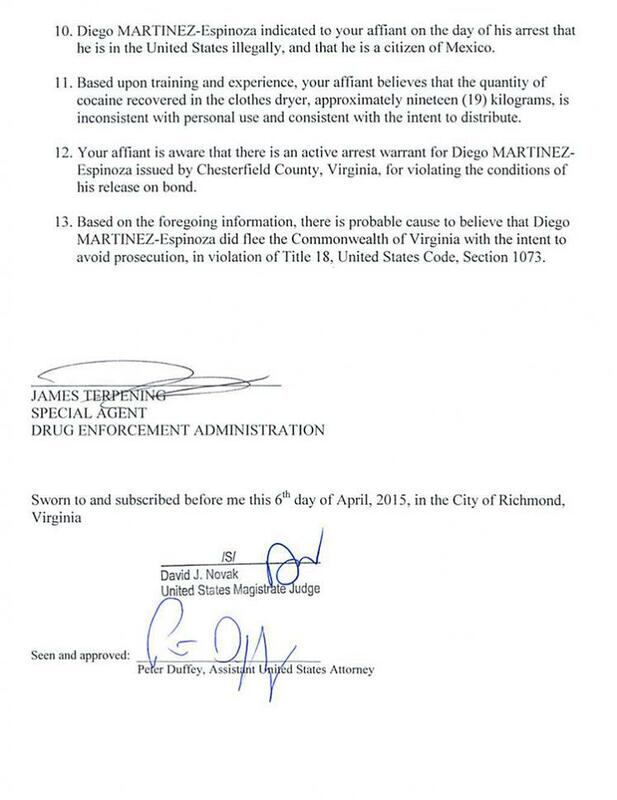 Martinez-Espinosa was outfitted with a new GPS unit, which he failed to recharge as required by his bond conditions. 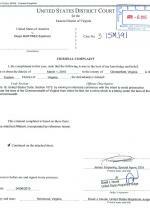 The ankle bracelet’s last signal was received by monitoring equipment on March 1. The following day, Martinez-Espinosa’s landlord entered his apartment and discovered that his tenant was gone. 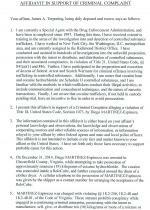 The GPS device, however, was still in the residence, having been “placed around a cat at the location,” reported Agent Terpening in an April 6 federal criminal complaint accusing Martinez-Espinosa of interstate flight to avoid prosecution. Martinez-Espinosa apparently thought that if the GPS device was on the cat as the feline padded around the residence, investigators would assume that he remained inside the apartment.